Published on 11 June, 2017. Yara-Majayara is a protected area in Baracoa. It offers many riches to explore to those who love hiking, ecotourism, archaeology and cyclotourism. As you can imagine, Yara-Majayara is overflowing with hiking or cycling options with different distances and features, but all of them with beautiful views in a unique rural enclave in Eastern Cuba! Established in 2007, the Yara-Majayara protected area covers almost 18 square km (7 square miles) and it has 8 km (5 miles) of coasts between the river Miel delta and Boma Bay. It comprehends a system of three limestone geological terraces, the highest of which is located at 160 meters above sea level. The views from each of these terraces are simply formidable. There are an important number of caves dating back to the late Pliocene epoch. Among the most outstanding local flora species you’ll see is a palm tree called yuraguano (coccothrinax yuraguana). It has a very slim and tall trunk and multiple short, firm fan-like palms. As you approach the protected area, behold beautiful Boca de Miel! It has an evocative name: Honey Mouth – and its quietness and sweet luminosity do it justice. Sitting where river Miel meets the sea, Boca de Miel is a tiny fishing community surrounded by mangroves – mostly of the rhyzophora mangle variety. A short boat ride takes you to the river’s other shore. There you’ll find a dirt road that will take you to the entrance of the protected area. Both in full daylight and at dusk, Boca de Miel offers precious views, and its unique, bucolic atmosphere never fails to charm travellers. Along Yara-Majayara’s intermediate terrace you will find small peasant communities such as Majana and Yara, featuring pretty rural houses with gardens that locals take pleasure in embellishing with great dedication. Decorative palm trees, blooming climbing plants, multicoloured bushes grace the fronts of local homes. The soil in this area is a deep red colour, high in iron content – very fertile. Here people grow tomatoes, okra, green beans… There are fruit trees such as soursop (annona muricata), annona (annona squamosa), papaya, mango… Folks raise animals such as chickens, pigs, goats and sheep. A core aspect of the Yara-Majayara protected area is its history. It was here that the Taíno settled after leaving Haiti behind, the Spaniards having taken it. This is the place where resistance to the invaders started, with chiefs Hatuey and Guamá heading the fight. The Taíno cultural heritage in these lands can be observed in key elements of its architecture, in the survival and transmission of various rural life practices, in its gastronomy and in the version of Spanish spoken not only in the Baracoa region, but in all of Cuba. Several teams of archaeologists including the Sociedad Arqueológica de Baracoa have carried important work here for decades. Nowadays, the excursion options offered in the Yara-Majayara protected area include guided visits comprehending archaeological sites such as the Archaeological Balcony (500 uninterrupted meters of caves), the Perla del Agua cave and the San Justo caves. At the top of the upper terrace, El Mirador! One of the most beautiful spots in the protected area is El Mirador. Sitting at the northwest end of the highest geological terrace, this lookout point lies within a family’s small farm. Yes, you can explore the region on a bicycle! For those who enjoy deep rural cyclotourism, Villa Paradiso recommends two different excursions in the area. Both start via the Carretera Central and crossing the bridge over river Miel towards Cabacú. From there, one of the excursions takes you through the Ojo de Agua plain before ascending to the third terrace in the protected area through Las Cuchillas. You cross cocoa farms and little water streams, pass by little clusters of houses where you will be able to see core elements of the Cuban human development model. Rural medical facilities take healthcare to all families and schools overflowing with children ensure education for all, even in the most faraway, hidden places. The other excursion also passes through Ojo de Agua but soon it turns towards Boca de Miel and continues along the second geological terrace, cycling through the tiny communities of Majana and Yara all the way to Boca de Boma. This excursion allows you to appreciate the view of caves on the cliffs between the highest and intermediate terraces – and the land with its various crops, the rural homes and their lovely ornamental gardens. At the entrance to the Yara-Majayara protected area you’ll find an information kiosk where foreign visitors pay entrance fees. A visit to El Mirador costs 3 CUC. The guided archaeological tours cost 10 CUC. The boat ride in Boca de Miel that takes you from one shore of river Miel to the other costs 1 CUC one-way. The livelihoods of families who live within the protected area rely mostly on agriculture – for some, on fishing. We encourage you to accept buying some fruit the locals could offer you – it’s a way of supplementing such families’ income and it allows them to benefit from ecotourism and sustainable tourism. We recommend you wear a swimsuit in case you’d like to enjoy a bath in Playa de Miel, including where the river meets the sea, when coming back. It is also advised to take with you some food – sandwiches, fruit and local treats such as bacanes, cucuruchos, chocolate made with the region’s organic cocoa. If you decide to go for a cycling excursion, renting a good bicycle in Baracoa for the day can cost between 5 and 6 CUC. Villa Paradiso offers its guests our customized cycling maps to the region, free of charge. We invite you to learn more about cycling and cyclotourism in Baracoa. Looking for the best things to do in Baracoa? Check out our blog, A Taste of Baracoa! 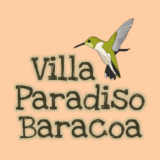 Book your stay at Villa Paradiso and explore the wonders of the Baracoa region. Check out our bedrooms, terraces, balconies and gardens!